The CALLITHUMPIAN CONSORT is dedicated to the proposition that music is an experience. 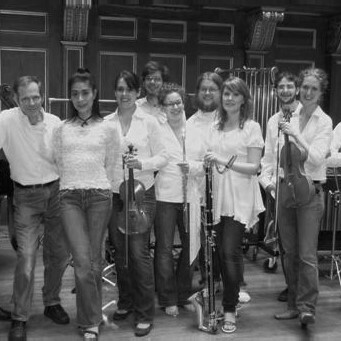 Founded by pianist and conductor Stephen Drury sometime in the 1980’s, the Consort is a professional ensemble producing concerts of contemporary music at the highest standard. Stephen Drury created the Callithumpian Consort in the belief that new music should be an exciting adventure shared by performers and listeners alike, and that the brand new masterpieces of our day are beautiful, sensuous, challenging, delightful, provocative, and a unique joy. Our audiences bring fresh ears to sounds never heard before; they bring their experiences from rock stadiums, jazz clubs, and internet electronica to the concert hall. They hunger for the new. Callithumpian’s repertoire is the new and unusual, encompassing a huge stylistic spectrum from the classics of the last 100 years to works of the avant-garde and experimental jazz and rock. It is grounded in the musical discoveries of John Cage, Karlheinz Stockhausen, John Zorn, Giacinto Scelsi, Morton Feldman, and Iannis Xenakis. Active commissioning and recording of new works is crucial to our mission. We have worked closely with composers John Cage, Frederic Rzewki, Helmut Lachenmann, Michael Finnissy, Jonathan Harvey, Lee Hyla, John Zorn, John Luther Adams, Franco Donatoni, Lukas Foss, Christian Wolff, Jo Kondo and many others. Recordings are available on Tzadik, Mode, and New World Records.